Digital program cleaning cycles ranging from 1 to 99 minutes–easy to operate. Heater — Powerful heater (300 watts) makes the temperature reach the presetting one quickly — significantly enhance cleaning. Large tank — Suitable for long dental equipment and tube. Tank Size: 300 x 155 x150. Tank working Capacity: 6 Liter (1.59 gallon). Outside Dimension: 330 x 180 x 310. ALL STAINLESS Construction (body, tank, cover and mesh basket) — Anti-Acid and Alkaline, resists damage from chemical spills. 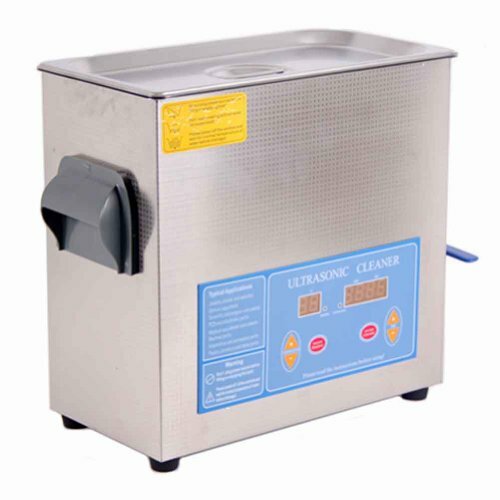 Ultrasonic cleaner is on based of Cavitation effect caused by high frequency utrasonic wave vibration signal in fluid.Microscopic bubbles are formed and they implode violently that cause cavitation which create an intense srubbing action on the surface of the item being cleaned.The bubbles are small enough to penetrate even microscopic crevices,cleaning them thoroughly and consistently. Ultrasonic cleaning is extrimely effective at removing dirt and grime which would normally require tedious manual cleaning by hand.It has been used to clean a wide variety of instuments and mechanical parts such as carburetors,returning them to almost “like new ” condition without damage to delicate parts. 1.STAINLESS steel mesh Basket is included in this package. 2.Circuit protector — Protect the circuit to lengthen unit life. 3.Wet-proof PCB — Good to be used in lab. 4.Some Industrial spare parts being adopted, allows its working in long time frame, and in dampness environment. 5.Three separable wires with ground wire — Safe and convenient. 6.Quality Industry IC — To be steady in unstable voltage condition. Warning : (1) Always unplug and empty the cleaner after using (2) While the machines working normally, ultrasonic and tank synchrony gives a well-proportioned sound,, and no shudder on the surface of the water, yet there is spray made by the tiny bubbles. If there are discontinuous surges, please add or release a little of washing solution in the tank, stopping the surges is good for cleaning the objects. (3) In order to ensure cleaning objects is cleaned, please run the machine discontinuously as for as possible (not more than 30 minutes), for a long time running causes temperature increment of the case, and speedup the aging of the electronic devices. (4) Flammable cleaning solution is forbidden. (5) Do not start the heater nor ultrasonic while the tank is empty (6) Prevent water or cleaning liquid from spattering into the case or shaker (7) Make sure the washing liquid is not hot, and turn the ultrasonic off and pull out the plug, while changing or emptying the tank (8) Discharge or spill the liquid, the tank must in the condition of normal temperature. and turn off machine ,plug power. (9) After use should be cleaned and remove dirt from the cleaning trough (10) Keep the surface of the machines clean. When the machine is broken or the ultrasonic weakens, it may be cause by above reason, please stop operating and contact maintenance staff.